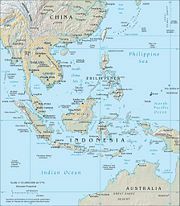 Southeast Asia, sometimes abbreviated to SEA, is a subregion of Asia, consisting of the countries south of China, east of India and north of Australia. South East Asia consists of two geographic regions: The Asian mainland and island arcs and archipelagoes to the east and southeast. The mainland section consists of Cambodia, Laos, Myanmar, Thailand, and Vietnam. Tai peoples and Austroasiatic peoples dominate. The maritime region consists of Brunei, East Timor, Indonesia, Malaysia, the Philippines, and Singapore. Some definitions of Southeast Asia include Taiwan at the north. Austronesian peoples predominate in the maritime region; taken together, the nations of the mainland and maritime regions make up the Association of Southeast Asian Nations (ASEAN), except East Timor (also known as Timor Leste), and Taiwan. A seafaring people, the region had been interconnected as early as 5000 B.C.E. Chinese merchants colonized the region before the arrival of the Europeans from the fifteenth century. Japan had made the most recent attempt to colonize the entire Southeast Asia region during World War II. ASEAN has been emerging as a major player in the world economic scene with several nations showing pace-setting economic development. Buddhism constituted the dominant religion, followed by Islam, and Christianity in the mainland region. Islam stands as the dominant religion followed by Christianity in the maritime region. Hinduism had a powerful impact in the region before the rise of Buddhism, Christianity, and Islam, the only region outside India in which Hinduism spread. All of the above belong to the Association of Southeast Asian Nations (ASEAN), except East Timor (also known as Timor Leste), which has applied for ASEAN membership. The area, together with part of South Asia, had been widely known as the East Indies or simply the Indies, until the twentieth century. Christmas Island and the Cocos (Keeling) Islands belong in Southeast Asia though governed by Australia. Taiwan has sometimes been included in Southeast Asia as well as East Asia but is not a member of ASEAN. Sovereignty issues exist over some islands in the South China Sea. Papua politically belongs to Southeast Asia through Indonesia, although geographically it is often considered part of Oceania. Beach on Ko Samui Thailand. Southeast Asia divides into two geographical regions, namely Mainland Southeast Asia (or Indochina) and the Maritime Southeast Asia (or the Malay Archipelago) (Indonesian language: Nusantara). The eastern parts of Indonesia and East Timor (east of the Wallace Line) are considered geographically part of Oceania. The Andaman and Nicobar Islands of India have been considered a geographical part of Southeast Asia. North-East India belongs to Southeast Asia culturally while sometimes considered both South Asian and Southeast Asian. Hainan Island and several other southern Chinese regions such as Yunnan, Guizhou, and Guangxi belong to both East Asian and Southeast Asian. Taiwan, which sits on the Tropic of Cancer and borders the South China Sea, has likewise often been included in definitions of Southeast Asia as well as East Asia. Designs on Dong Son drum belonging to Iron Age prehistoric Dong Son culture locating on Red River Delta, Vietnam. Solheim and others have shown evidence for a Nusantao (Nusantara) maritime trading network ranging from Vietnam to the rest of the archipelago as early as 5000 B.C.E. to 1 C.E. The peoples of Southeast Asia, especially those of Austronesian descent, have been seafarers for thousands of years, some reaching the island of Madagascar. Their vessels, such as the vinta, were ocean-worthy. Magellan's voyage records the superiority of their vessels manœuvrably compared to the European ships. Passage through the Indian Ocean aided the colonization of Madagascar by the Austronesian people, as well as commerce between West Asia and Southeast Asia. Gold from Sumatra reached as far west as Rome. Originally most people practiced animism, built upon later by Brahmanic Hinduism. Theravada Buddhism followed in 525 C.E. In 1400s, Islam appeared, becoming a vital force. That forced the last Hindu court in Indonesia to retreat to Bali. In Mainland Southeast Asia, Myanmar, Cambodia and Thailand retained the Theravada form of Buddhism, brought to them from Sri Lanka. That type of Buddhism fused with the Hindu-influenced Khmer culture. Architecture in the Srivijayan style. Surat Thani Thailand. Scant information about Southeast Asian religious beliefs and practices existed before the advent of Indian merchants and religious influences from the second century B.C.E. onwards. Prior to the thirteenth century, Buddhism and Hinduism were the main religions in Southeast Asia. The Jawa Dwipa Hindu kingdom in Java and Sumatra existed around 200 B.C.E. The history of the Malay-speaking world begins with the advent of Indian influence, which dates back to at least the third century B.C.E. Indian traders, arriving in the archipelago for its abundant forest and maritime products as well as to trade with merchants from China, also discovered the Malay region at an early date. Both Hinduism and Buddhism were well established in the Malay Peninsula by the beginning of the first century C.E., spreading across the archipelago. Hinduism influenced Cambodia first, arriving at the beginning of the Funan kingdom. Hinduism became one of the Khmer Empire's official religions. Cambodia serves as the home to one of the only two temples dedicated to Brahma in the world. Angkor Wat is also a famous Hindu temple of Cambodia. Angkor Wat, in Siem Reap, Cambodia, is the largest religious temple in the world and the largest pre-industrial city in the world. The Majapahit Empire was an Indianized kingdom based in eastern Java from 1293 to around 1500. Hayam Wuruk, whose reign from 1350 to 1389 marked the empire's peak when it dominated other kingdoms in the southern Malay Peninsula, Borneo, Sumatra, Bali, and the Philippines, had been its greatest ruler. The rest of the Philippines also made tribute payments to the empire. The Cholas excelled in maritime activity in both the military and mercantile fields. Their raids of Kedah and the Srivijaya, and their continued commercial contacts with the Chinese Empire, enabled them to influence the local cultures. Many of the surviving examples of the Hindu cultural influence found today throughout the Southeast Asia resulted from the Chola expeditions. Chinese merchants have traded with the region from before the arrival of the Portuguese as evidenced in Magellan's voyage records stating Brunei possessed more cannon than the European ships. The Chinese alone possessed cannon at that time indicating that the Chinese fortified them. Malaysian legend relates that a Chinese Ming emperor sent a princess, Han Li Po to Malacca, with a retinue of 500, to marry Sultan Mansur Shah after the emperor had been impressed by the wisdom of the sultan. Han Li Po's well (constructed 1459) and Bukit Cina, where her retinue settled, became historical sites. The strategic value of the Strait of Malacca, which the Sultanate of Malacca controlled in the 15th and early 16th century, caught the attention of Portuguese writer Duarte Barbosa, who in 1500 wrote: "He who is lord of Malacca has his hand on the throat of Venice." Western influence began in the 1500s, with the arrival of the Portuguese and Spanish in Moluccas and the Philippines. Later the Dutch established the Dutch East Indies; the French Indochina; and the British Strait Settlements. Of all the Southeast Asian countries, Thailand along escaped colonization. European explorers reached Southeast Asia from the west and from the east. Regular trade between ships sailing east from the Indian Ocean and south from mainland Asia provided goods in return for goods such as honey and hornbill beaks from the islands of the archipelago. Europeans brought Christianity, enabling Christian missionaries to practice widely. Siam (Thailand) also welcomed Western science and technology to enter their country. During World War II, the Imperial Japan invaded most of the former occidental colonies. The Shōwa occupation regime committed violent actions against indigenous civilians such as the Manila Massacre and the implementation of a system of forced labor, such as the one involving four to ten million romusha in Indonesia. Most countries in the region enjoy national sovereignty. Democratic forms of government and the recognition of human rights have taken root. ASEAN provides a framework for the integration of commerce. Conflicting territorial and maritime claims continue, including the conflicting claims by Taiwan and China over the Spratly Islands. Hạ Long Bay, a Natural World's Heritage Site in Vietnam. Chocolate Hills in Bohol, Philippines. Geologically, the Indonesian archipelago is one of the most active volcanic regions in the world. Geological uplifts in the region have also produced some impressive mountains, culminating in Mount Kinabalu in Sabah, Malaysia on the island of Borneo with a height of 4,101 meters (13,455 ft) and also Puncak Jaya in Papua, Indonesia at 4,884 meters (16,024 ft), on the island of New Guinea. The Australasian continental plate defines a region adjacent to Southeast Asia, politically separated from the countries of Southeast Asia. A cultural touch point lies between Papua New Guinea and the Indonesian region of Papua and West Papua, which shares the island of New Guinea with Papua New Guinea. The climate in Southeast Asia is mainly tropical—hot and humid year round with heavy rainfall. Southeast Asia has a wet and dry season caused by seasonal shift in winds or monsoon; the tropical rain belt brings additional rainfall during the monsoon season. The rainforest stands as the second largest on earth (the Amazon being the largest). The mountain areas in the northern region, where high altitudes lead to milder temperatures and drier landscape, has proven an exception to that type of climate and vegetation. Some areas are desert-like. Southeast Asia has a diversity of animals; on the islands of Borneo and Sumatra, the Orangutan (man of the forest), the Asian Elephant, the Malayan tapir, the Sumatran Rhinoceros and the Bornean Clouded Leopard live. Six subspecies of the Binturong or bearcat exist in the region, though the one endemic to the island of Palawan has been classed vulnerable. The Wild Asian Water Buffalo, and on various islands related dwarf species of Bubalus such as Anoa once abounded widely in Southeast Asia; the Domestic Asian Water buffalo remains common across the region, but its remaining relatives have been classified endangered. The mouse deer, a small tusked deer as large as a toy dog or cat, inhabits Sumatra, Borneo and Palawan Islands. The gaur, a gigantic wild ox larger than even wild Water buffalo, dwells mainly in Indochina. Birds such as the peafowl and drongo live in the subregion as far east as Indonesia. The babirusa, a four-tusked pig, exists in Indonesia as well. The hornbill has been prized for its beak and used in trade with China. The horn of the rhinoceros, not part of its skull, was prized in China as well. Both have been baned for trade internationally. The Wallace Line splits the Indonesian Archipelago, a line that runs along a tectonic plate boundary and separates Asian (Western) species from Australasian (Eastern) species. The islands between Java/Borneo and Papua form a mixed zone, known as Wallacea, where both types occur. The shallow waters of the Southeast Asian coral reefs have the highest levels of biodiversity for the world's marine ecosystems, where coral, fish and mollusks abound. The whale shark swims in the South China Sea. The trees and other plants of the region are tropical; in some countries where the mountains stand at a high enough altitude, temperate-climate vegetation exists. Those rainforest areas have currently suffered from logging, especially in Borneo. While Southeast Asia enjoys rich flora and fauna, severe deforestation has been causing habitat loss for a number of endangered species such as orangutan and the Sumatran tiger. At the same time, haze has been a regular occurrence. The worst regional haze occurred in 1998 when thick haze covered many countries in the region. In response, several countries in Southeast Asia signed the ASEAN Agreement on Transboundary Haze Pollution to combat haze pollution. Even prior to the penetration of European interests, Southeast Asia was a critical part of the world trading system. The Ryukyu Kingdom often participated in maritime trade in Southeast Asia. A wide range of commodities originated in the region, but especially important were such spices as pepper, ginger, cloves, and nutmeg. The spice trade initially was developed by Indian and Arab merchants, but it also brought Europeans to the region. First the Portuguese, then the Dutch, and finally the British and French became involved in this enterprise in various countries. The penetration of European commercial interests gradually evolved into annexation of territories, as traders lobbied for an extension of control to protect and expand their activities. As a result, the Dutch moved into Indonesia, the British into Malaya, and the French into Indochina. While the region's economy heavily depends on agriculture, manufacturing and services are increasingly becoming more important. Newly industrialized countries include the Philippines, Indonesia, Malaysia, and Thailand, while Singapore and Brunei are well-established developed countries. The rest of Southeast Asia is still heavily dependent on agriculture, but Vietnam and Cambodia are making steady progress in developing their industrial sectors. The region has emerged as one of the most productive in manufacturing microprocessors. Oil deposits abound in the region. In a move to avoid disruption of the kind recently caused by the cutting of the undersea cable from Taiwan to the U.S. in a recent earthquake, 17 telecommunications companies have contracted to build a new submarine cable to connect Southeast Asia to the U.S.
Southeast Asia has an area of approximately 4,000,000 km² (1.6 million square miles). As of 2004, more than 593 million people lived in the region, more than a fifth of them (125 million) on the Indonesian island of Java, the most densely populated large island in the world. The region enjoys a diverse distribution of religions and people which varies by country. Some 30 million overseas Chinese also live in Southeast Asia, most prominently in Christmas Island, Malaysia, the Philippines, Singapore, Indonesia and Thailand, and also, as the Hoa, in Vietnam. Pie chart showing the distribution of population among the nations of Southeast Asia and among the islands of Indonesia. According to a recent Stanford genetic study, the Southeast Asian population has a mixture of ethnic groups. Although primarily descendants of Austronesian, Tai, and Mon-Khmer-speaking immigrants who migrated from Southern China during the Bronze Age and Iron Age, Arab, Chinese, Indian, Polynesian and Melanesian genes have contributed to the pool. Large pockets of intermarriage between indigenous Southeast Asians and those of Chinese descent exist. They form a substantial part of everyday life in countries such as Vietnam, Singapore, Thailand, and the Philippines. Indonesia and Malaysia also has a few mixed Southeast Asian-Chinese populations. Countries in Southeast Asia practice many different religions. Mainland SEA countries, including Thailand, Cambodia, Laos, Myanmar, and Vietnam, practice predominantly Buddhism. Singapore's population is also predominantly Buddhist. Vietnamese widely practice ancestor worship and Confucianism. In the Malay Archipelago, people living in Malaysia, western Indonesia and Brunei practice mainly Islam. Christianity stands as the predominant faith in the Philippines, eastern Indonesia and East Timor. The Philippines has the largest Roman Catholic population followed at a large distance by Vietnam. Southeast Asia boasts diverse religions and peoples and no country is homogeneous. In the world's most populous Muslim nation, Indonesia, Hinduism dominates on islands such as Bali. Christianity also predominates in the Philippines, New Guinea and Timor. Pockets of Hindu population live around Southeast Asia in Singapore, and Malaysia, for example. Garuda (Sanskrit: Garuḍa), the phoenix, representing the mount (vahanam) of Vishnu, serves as a national symbol in both Thailand and Indonesia; in the Philippines, gold images of Garuda have been found on Palawan; gold images of other Hindu gods and goddesses have also been found on Mindanao. Balinese Hinduism is somewhat different from Hinduism practiced elsewhere, as Animism and local culture have been absorbed into it. Christians live throughout Southeast Asia, in the majority in East Timor and the Philippines, Asia's largest Christian nation. In addition, older tribal religious practices in remote areas of Sarawak in East Malaysia and Papua in eastern Indonesia exist. In Myanmar, Sakka (Indra) is revered as a nat. In Vietnam, devotees practice a form of Mahayana Buddhism influenced by native animism with with strong emphasis on Ancestor Worship. Each of the languages have been influenced by cultural pressures from trade and colonization. Thus, for example, a Filipino, educated in English and Filipino, as well as in his native tongue (for example, Visayan), might well speak another language, such as Spanish for historical reasons, or even Chinese for economic reasons; a Malaysian might well speak Malay, Chinese as well as English, again for economic reasons. Rice paddy agriculture has existed in Southeast Asia for thousands of years, ranging across the subregion. Some dramatic examples of these rice paddies populate the Banaue Rice Terraces in the mountains of Luzon in the Philippines. Maintenance of these paddies is very labor-intensive. The rice paddies are well-suited to the monsoon climate of the region. Stilt houses can be found all over Southeast Asia, from Thailand and Laos, to Borneo, to Luzon in the Philippines, to Papua New Guinea. The region has diverse metalworking, especially in Indonesia. This include weaponry, such as the distinctive Kris, and musical instruments, such as the Gamelan. The region's chief cultural influences have been from either China, India or both, with Vietnam considered by far the most Chinese-influenced. As a rule, the peoples who eat with their fingers were more likely influenced by the culture of India, for example, than the culture of China, where people first ate with chopsticks; tea, as a beverage, can be found across the region. The fish sauces distinctive to the region tend to vary. "Buffalo boy plays a flute," Đông Hồ painting, Vietnam. Dance in much of Southeast Asia includes movement of the hands, as well as the feet. Puppetry and shadow plays had been a favored form of entertainment in past centuries. Hinduism, brought centuries earlier, dramatically influenced the Arts and Literature in some of Southeast Asia countries. In Indonesia, though they converted to Islam, they retained many forms of Hindu influenced practices, cultures, arts and literatures. For example, the Wayang Kulit (Shadow Puppet) and literature like the Ramayana. That holds true for mainland Southeast Asia (excluding Vietnam). Dance movements, Hindu gods, Arts also fused into Thai, Khmer, Lao, and Burmese cultures. Gongs in Tây Nguyên—the main factor of the World's Intangible Heritage: "Space of Gong culture in the Central Highlands of Vietnam." Traditional music in Southeast Asia has a varied face with its many ethnic and cultural divisions. Main styles of traditional music appear: Court music, folk music, music styles of smaller ethnic groups, and music influenced by genres outside the geographic region. Of the court and folk genres, Gong-chime ensembles and orchestras make up the majority (the exception being lowland areas of Vietnam). Gamelan orchestras from Indonesia, Piphat/Pinpeat ensembles of Thailand & Cambodia and the Kulintang ensembles of the southern Philippines, Borneo, Sulawesi, and Timor comprise the three main distinct styles of musical genres that have influenced other traditional musical styles in the region. String instruments also are popular in the region. Originally, Indians taught the native inhabitants about writing, as shown through Brahmic forms of writing present in the region such as the Balinese script shown on split palm leaf called lontar, right. The antiquity of this form of writing extends to before the invention of paper around the year 100 in China. Note each palm leaf section was only several lines, written longitudinally across the leaf, and bound by twine to the other sections. The outer portion was decorated. The alphabets of Southeast Asia tended to be abugidas, until the arrival of the Europeans, who used words that also ended in consonants, not just vowels. Other forms of official documents, which did not use paper, included Javanese copperplate scrolls. That would have been more durable in the tropical climate of Southeast Asia. ↑ Solheim, Journal of East Asian Archaeology 2000 (2): 273-284. ↑ 2.0 2.1 Laurence Bergreen, Over the Edge of the World: Magellan's Terrifying Circumnavigation of the Globe (HarperCollins Publishers, 2003, ISBN 0-06-621173-5). ↑ K.A. Nilakanta Sastri, The CōĻas (1935), 709. ↑ R. P. Anand, Origin and Development of the Law of the Sea: History of International Law Revisited (The Hague: Martinus Nijhoff, 1983), 56. ↑ Sean Yoong, 17 Firms to Build $500M Undersea Cable, International Business Times (April 27, 2007). ↑ CIA World Factbook, Field Listing—Religions. Retrieved February 24, 2007. ↑ CIA World Factbook, Indonesia. Retrieved January 21, 2009. Anand, R. P. 1983. Origin and Development of the Law of the Sea: History of International Law Revisited. Publications on ocean development, v. 7. The Hague: Martinus Nijhoff. ISBN 9789024726172. Bergreen, Laurence. 2003. Over the Edge of the World: Magellan's Terrifying Circumnavigation of the Globe. New York: Morrow. ISBN 9780066211732. Hall, D. G. E. 1964. A History of South-east Asia. London: Macmillan. OCLC 411176. Nilakanta Sastri, Kallidaikurichi Aiyah Aiyar. 1984. The Cōlas. Madras University Historical Series. OCLC 252081337. Solheim, Wilhelm. 2000. "Taiwan, Coastal South China and Northern Viet Nam and the Nusantao Maritime Trading Network." Journal of East Asian Archaeology. 2 (1/2): 273-284. OCLC 88150600. Somers Heidhues, Mary F. 2000. Southeast Asia: A Concise History. New York, NY: Thames & Hudson. ISBN 9780500251171. This page was last modified on 13 October 2015, at 15:11.